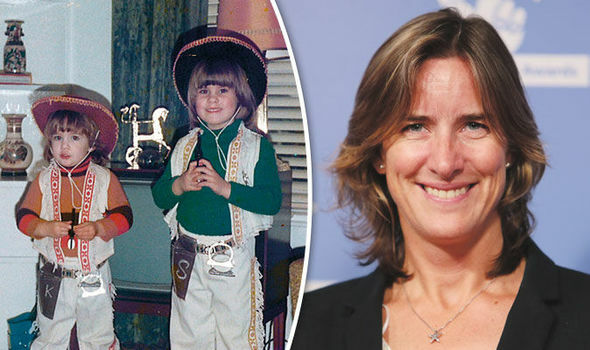 Britain’s most-decorated woman Olympian, Dame Katherine GRAINGER, 41, pays tribute to her older sister who has been her rock and inspiration. This is me on the left with my sister Sarah, who is 20 months older, at our grandparents’ house in Aberdeen. We always spent summer holidays with them and Gran was from that generation that was habitually baking, cooking and making things. She made the cowboy costumes we’re wearing. We adored being there and spending time with them. My competitive spirit has always been there and I benefited hugely from having a big sister I could accompany to swimming, lifesaving, badminton, tennis and ski club. It didn’t feel scary going to new things, because she was there. And once there, I felt I should be as good as she was. I struggled to keep up, but it never occurred to me that I shouldn’t compete against her. Mum says it started the minute my eyes could focus: they clamped on to Sarah and I attempted to copy her in everything. Sarah was torn. She hated beating and upsetting me but also harboured a deep desire to win. As the younger sibling, however, I had no such qualms about wanting to finish on top. When we were growing up, Sarah was good at everything. She also had a laid-back and generous nature and always had lots of friends and countless boyfriends. On Valentine’s Day, the majority of cards and all the flowers would be for her. Mind you, Sarah hasn’t always had things easy either. When we were kids, the local bully, a deceptively sweet and innocent-looking girl, made her life a misery whenever she could, particularly on the way to and from school. To Sarah’s immense credit, she didn’t rise to the baiting or react in any physical way, but I hated seeing her beaten down by the verbal abuse. If I’d intervened, it would have simply made the situation worse and Sarah would have hated me for trying, but the anger, frustration and sense of unfairness has never left me. Now we’re adults, Sarah is still the first person I call when times get tough. It was a very difficult year leading up to the Rio Olympics and she knows better than anyone what happened behind the scenes. We’re used to seeing the great success stories, the positive headlines and the wonderful results, but there are a lot of lows that people don’t see – the day-to-day stress and exhaustion, the pressure of selection, not knowing if you’re part of the team or whether you’ll be any good on race day. As an athlete you don’t want to show insecurity and doubt in front of your teammates, whereas with my sister I can be incredibly honest about the struggles and injuries I’ve had. Even if I try to cover up something on the phone, she’ll know, just by the tone of my voice, that I’m keeping something back. Without pushing in an uncomfortable way, she can always get to the source of my problems. Even though she’s a hard-working teacher, she’s very generous with her time and understanding, so it’s easy to open up and share things with her. But it’s not just that she gives me big-sisterly support and reassurance. She can be practical and tough, too, and gives me the blunt truth when I need to hear it.